Hey Haiku-ers! Did you read my announcement? Can’t make me. Ok… Maybe. Happy as bird with french fry … Love it!!! A Happy New Year to you, Jenn! Look forward to the changes. But I don’t wanna leave a comment. As for the changes, ok, I was getting lazy and just linking to the blog itself. I did the rest of it though! I’ll link better. MMT tells me that “Brilliance” is 2 syllables in the states, so we’ll make it either/or for next week! I’m going to try to make a weekly effort over here… no telling if I actually will get it done. Thanks for hosting, Jenn! I think I did the link right. LOL! Love it! And thanks for posting your limerick in this week’s Limerick-Off challenge! Happy New Year as well….I think I’ve been posting weekly for a month now?? Hope I don’t make any more mistakes! 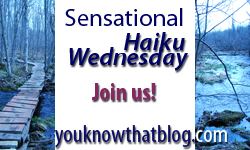 I have tried to write in this weeks Sensational Haiku Wednesday a haiku in the classical way with 5-7-5 syllables. I hope I succeeded. Thank you for the new Sensational Haiku Wednesday. I still can’t leave you a comment on your blog – I wish I could! Thank you for trying to do 5-7-5, Chèvrefeuille! I wonder if the language barrier is an issue – you write English well, but the syllables may not be exactly what you think they are? I appreciate that you tried, though, especially as English is not your first language, and I enjoyed your haiku.